While many fans of comic books tend to focus on the action, mythology and big battle scenes of their favorites heroes and villains, another huge aspect of these characters has always been the relationships they form. Whether it’s classic couples like Superman and Lois Lane or Luke Cage and Jessica Jones, or more modern couples like Poison Ivy and Harley Quinn or War Machine and Captain Marvel, these pairings have been a huge driving force in the fandom for years. Whether or not the relationships are destructive, romantic or somewhere in between, the romance is just as valuable to the character’s development as their epic battles and the lore they are a part of. Yet, what would happen if fans came across a truly strange pairing? Over the years, many fans have come up with some truly amazing fan art that depicts their favorite heroes and villains in a romantic relationship. Some of these will have you looking at these characters in a whole new light and wishing the pairing was real. Others will be so strange and out there you will not be able to handle it. A few of these pairings even jump the divide between Marvel and DC Comics, pairing some characters who would never have an opportunity to meet in a romantic light like no other. So come along on a journey with us as we explore some truly amazing fan art that depicts strange, fun and unexpected superhero couples. You will definitely not want to miss this. This next pairing puts two heroes with a high moral standing who are both soldiers, warriors and always do what is right over what is easy. The first is, of course, The Cap, the man out of time itself who leads the Avengers into battle against the forces of evil. Then there is Wonder Woman, the Amazon warrior who helps lead the Justice League into battle on a regular basis. The two heroes would make an incredible couple, representing the best and morally upright people of the world. Jumping into the Nolan Batman universe, we are greeted with an unusual pairing. Here we see Talia al Ghul, daughter of Ra’s al Ghul, the demon’s head of the League of Assassins. Sworn to avenge his passing and blaming Batman, she orchestrated the events of the Dark Knight Rises film, while using her friend and ally Bane, an imprisoned soldier who protected her as a child, to be the face of her plan. Here the artist imagines the two becoming a couple, forming a natural love over their shared past and interests. Another very unlikely pairing has to be Thor and Deadpool. Thor, the god of thunder and prince of Asgard, is one of Earth’s Mightiest Heroes. A defender of the nine realms, he fights valiantly and has no motivation other than to protect others. Meanwhile, Deadpool is a mercenary, who takes money for jobs that range from protecting the innocent to eliminating threats and more. His morality doesn’t really match up to the Odinson himself, so seeing this pairing is strange indeed. Two heroes who have complex pasts are Black Widow and The Winter Soldier. Both are former life-takers turned heroes. Widow is Natasha Romanov, a former spy, and life-taker for the KGB who was shown a more heroic way and became an Agent of S.H.I.E.L.D. and an Avenger. Winter Soldier is Bucky Barnes, Cap's brainwashed friend who fights to recover his memories and erase the mistakes of the past. These two have a history of romance in the comics, but their MCU versions have not yet hit that milestone in their character arcs. Our first unexpected pairing comes in the form of best friends Steven Rodgers and Bucky Barnes. Best friends who served in WWII together and were separated in battle, Steve eventually was thawed out of the Arctic in modern day USA, while Bucky had been experimented on and turned into a life-taker. Now, in this amazing fan art, we see the two friends reunited, the peril of battle behind them as they adjust to life in the real world, and perhaps admitting to feelings they had all along. Another best friend pairing turned romantic, this fan art reimagines the relationship between mutant leaders and friends turned enemies Professor Xavier and Magneto. Two powerful mutants, Professor X is an all-powerful telepath who hopes to bridge the gap between mutants and humanity for peace, while Magneto views humanity as evil and mutants as the next step in evolution who are meant to rule. Yet in this fan art, we see the two men’s ideologies taking a step back as they kindle a growing romance between one another. Two very powerful heroes with a mastery of weather are Marvel’s Thor and Storm. Thor is the prince of Asgard and an all-powerful hero who uses his powers over lightning and the elements, (along with brute strength, flight, and his magical hammer Mjolnir), to protect Earth as an Avenger. Storm is one of the most powerful mutants who works with the X-Men, Professor X’s heroic team of mutants hoping to save humanity and mutants alike. Her power over the elements makes her a fantastic pairing with Thor and his limitless power. This next pairing is truly strange, as it depicts two characters who regularly interact in the comics and yet would never in a million years have a relationship. This artist depicted Deadpool, the merc with a mouth, with a college-age Peter Parker, aka Spider-Man. Spider-Man, of course, is the teenage boy turned man who was bitten by a radioactive spider and gained amazing abilities, using them to fight evil and protect those who can’t protect themselves. Seeing these two opposites in such an intimate setting is truly weird, to say the least. Two men who have created the ultimate “bro-mance” in the MCU has to be Bruce Banner, the man who harbors the Avenger's The Hulk inside of him, and Tony Stark, otherwise known as Iron Man. The two friends are both scientists who push the limits and explore what is possible in all things science related. Here we see Bruce attempting to repair Tony’s suit, while Tony tries to initiate a more intimate moment with his friend turned partner. This next fan art pairs two of the Guardians of the Galaxy, but not who you would expect. The team as made famous in recent years thanks to the MCU consists of Star-Lord, Rocket Racoon, Drax the Destroyer, Gamora, and Groot. It’s these last two who have been paired together. Groot is a powerful, tree-like creature who uses the words I AM GROOT to express many different things, while Gamora is the adoptive daughter of Thanos who was raised to be a life-taker but fled her father when she met the Guardians. These two becoming a couple is just truly bizarre to imagine. Two very unlikely characters that would be just strange to see together would be Heimdall and Loki. Known more recently for their portrayals by actors Idris Elba and Tom Hiddleston, Heimdall is the Asgardian guardian who protects the realm from invaders and is able to see over all the realms, while Loki is the mischievous prince of Asgard and brother to Thor himself. The two have always had a contentious relationship in the comics and MCU, but this artist imagines the two finding common ground in the form of romantic feelings. While many know from the comics that Daredevil has many failed relationships with women like Karen Page and Elektra and Jessica Jones has a strong relationship with Luke Cage, fans of the Netflix series based on these characters have seen both heroes tackle dark pasts. With darkness haunting them both, perhaps the tragedy and pain they both feel will bring these two heroes into a more romantic light, especially with the bond they formed briefly in The Defenders series on Netflix. Two characters that have definitely pushed the limits of sanity in their respective comic books and are considered anti-heroes are Harley Quinn of DC Comics fame and Deadpool of Marvel Comics. Both having a twisted sense of humor and sometimes even breaking the 4th wall in their own comics, each of them is willing to do whatever is necessary for their missions, and have no problem getting their hands dirty. They would make the perfect couple, if they didn’t try to take each other out first. The Armored Avenger and the Man of Steel are the next two characters to bridge the DC/Marvel gap and become one couple. Iron Man is Tony Stark, the billionaire arms dealer turned hero who works to protect the world alongside the Avengers. Superman is Clark Kent, aka Kal-El, the last son of the planet Krypton who was raised on Earth and uses his god-like power to protect humanity, even becoming one of the leaders of the Justice League. This artist imagines the two men flying through the skies together, a romantic glean in their eyes. Another unusual pairing you would most likely never encounter would be the Amazon warrior Wonder Woman and the anti-hero Harley Quinn. Wonder Woman is Diana, Princess of the Amazons and a demigod in some origin stories. She serves alongside Batman and Superman as a leader of the Justice League. Meanwhile, Harley is the former love interest and sidekick to the evil Joker who became an anti-hero when she finally left him. Both are strong and amazing female characters, but it’s strange to see the two paired romantically together. This pairing jumps the divide once more, but is interesting to see unfold. Catwoman is the feline-inspired thief turned anti-hero who has a romantic interest in Batman and often walks a fine line between hero and villain. Black Widow is a former assassin and spy turned Avenger, who works to make up for the sins of her past after being brainwashed by a spy organization. Seeing the two women who work hard to find the balance between hero and villain is interesting to see paired together romantically, don’t you think? These classic X-Men characters are not known for their romantic feelings for one another. Nightcrawler is the teleporting blue-skinned mutant who many fear due to his devilish appearance, but who is truly kind and heroic. Shadowcat is the most popular code name for Kitty Pryde, the mutant leader who can walk through walls and phase through matter. While typically paired in the comics with either Star-Lord or Colossus, this artist reimagines the two mutants as teens who have formed a close bond and developed feelings for one another. Another unlikely pairing brought to life with amazing artwork is this rendition of The Cap and Ant-Man. This version of Ant-Man is Scott Lang, made famous by his recent MCU adaption from actor Paul Rudd. A former thief turned hero and successor to original Ant-Man Hank Pym, Scott showed great admiration for Steve Rodgers, even helping him in his fight in Civil War. This artist imagines the bond between the two heroes turning romantic, something you would not have expected from the pair. Stepping into the realm of DC Comic’s Arrowverse, we now have a fan art piece that pairs the Arrowverse’s first two major heroes, Oliver Queen’s Green Arrow and Barry Allen’s The Flash. Oliver became the Green Arrow after years of hardship stranded on an island and beyond, only to return to his home city to save it. Barry meanwhile took on the Flash after being caught in the particle accelerator explosion and connecting to the Speed Force, using his power to discover who took his mother’s life. This pairing puts the two heroes together in a fast-paced and intimate situation. The pairing of Harley Quinn with other heroes and villains continues. One of DC Comics most popular characters, Harley began as a sidekick on the famous Batman: The Animated Series show and became a staple of the DC Comics canon. Here we see her paired with Mystique, the shape-shifting mutant and soldier working for Magneto to further the mutant dominance cause. The two women straddle that line between good and evil well, and this artist does a wonderful job showing their relationship bloom. Two men who became villains and found a story of redemption waiting for them in the MCU were none other than The Winter Soldier and Loki. The Winter Soldier is Bucky Barnes, best friend of The Cap who lost his arm and became brainwashed into becoming a life-taker for Hydra, while Loki is the prince of Asgard and brother of Thor who seeks to usurp the throne from his father Odin. Each found a way of redeeming themselves for their twisted ways, most recently in Avengers: Infinity War, and seeing the two paired romantically is definitely interesting to see unfold. Two of the more humorous and light-hearted heroes of both DC Comics and Marvel has to be Marvel’s Spider-Man and DC’s The Flash. Spider-Man is shown in this image wearing his outfit from the MCU film Spider-Man: Homecoming, while the Flash appears to be his Justice League, DCEU film version as made famous by Ezra Miller. Seeing the speedster traveling across time and space to the MCU and forming a relationship with Peter is interesting to see unfold. This next pairing puts two of Marvel’s most powerful and skilled female heroes together. Here we see Spider-Woman, aka Jessica Drew, who has had several origin stories but ultimately involves being brainwashed to serve Hydra, having superpowers, and regaining her memories to become a hero. Then there is Captain Marvel, the newest hero to join the MCU and an iconic comic book character. She is Carol Danvers, an Air Force pilot who gains powers and becomes the iconic Captain Marvel. Pairing these two strong and formidable heroes together just makes sense. Two heroes who went from strained allies to good friends and then brief enemies, the history between Tony Stark and Steve Rodgers is vast. The leaders of two opposing sides in the Superhero Civil War, the two men’s difference in ideologies and opposing views on superhero responsibility have strained their relationship in both comics and the MCU. While strange, seeing these two men together in this artist’s rendition of a possible romance is interesting to see. This pairing not only jumps the DC/Marvel divide, but makes for a very strange pairing. Wonder Woman is quite the formidable warrior and a serious, honor-bound hero. Spider-Man, on the other hand, is very humorous, using his quick wit and humor to push his enemies buttons and get the upper hand. However, he too has a great sense of honor and responsibility, making their pairing make much more sense, although the tattoo sleeve he has is definitely a departure from the hero we know. Wolverine’s love interests in both the films and comics have been treacherous for him. The women in his life have a habit of either going evil, being taken out or going out in a blaze of glory. From Jean Grey to Mariko, his relationships just don’t work out for him. Yet, in this artist’s fan art, we see he has bonded and grown fond of fellow X-Man Storm, both of whom are loyal to Charles Xavier and his cause. 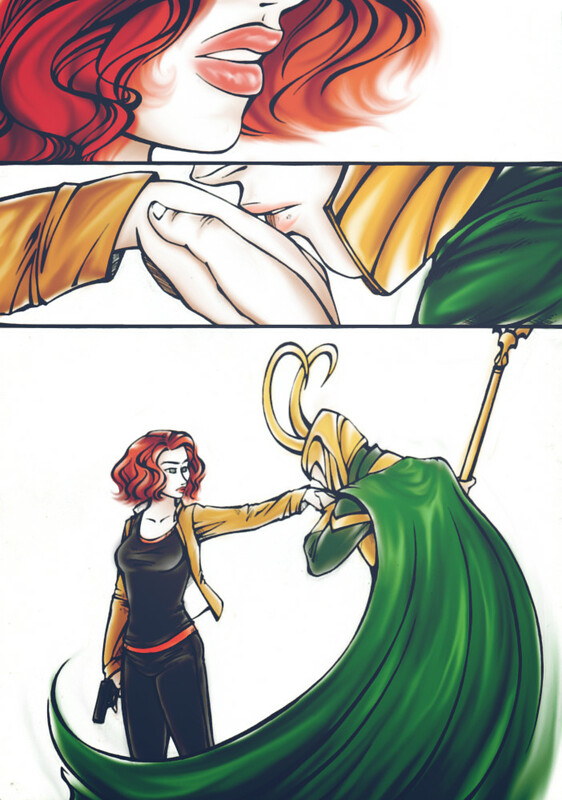 Yet another unusual and strange pairing, Black Widow & Loki are featured in this fan art as a couple. The two had a standoff in an interrogation during the first Avengers film, with Widow gaining the upper hand to learn a piece of his plan. Yet, in this reimagining, we see that perhaps Loki and Widow don’t become enemies, but instead recognize a kindred spirit in one another, recognizing the natural ability for deception they both possess. This next pairing is truly unique, as it plays into some fan theories and fan art that came about after the release of Iron Man 2. That film in the MCU really opened the door to the larger Marvel universe, especially including Black Widow and Nick Fury. Fans theorized that perhaps Widow and Iron Man would briefly have a romance, but that never came to be, despite it happening once in an Ultimate version of the comics. This fan art shows what would have happened had the two heroes grown intimate with one another. This last pairing comes straight out of the comics, featuring a villainess who has yet to make her MCU debut. At various points in the comics, Loki has taken on new forms as he either passes on or morphs. Sometimes he is a teenager or child, while sometimes he changes gender to become a woman. Here we see such a case, along with a relationship with the villain Enchantress, who is obsessed with Thor and causes magical trouble on Earth regularly.